95W Ø8.73x50.8mm tungsten dart rod price is 4.00USD/PC on Apr. 8, 2019. Very high percentages of tungsten, such as 98% tungsten darts, have a wonderful dense feel and a surface that resists wear for a long time. However, the high concentration of tungsten powder also makes them brittle, and more prone to break if dropped on hard surface such as a concrete garage floor. To get around those problems, most tungsten dart rods are made of mixtures ranging from 70% to 95% tungsten. Low density darts wear faster, from skin acid, friction, hitting other darts, falling on floors, etc. 90W Ø6.35x45.72mm tungsten dart billet price is 10.60USD/PC on Mar. 28, 2019. Tungsten is the world's 4th heaviest metal. Tungsten heavy alloy contains mainly tungsten ranging from 80wt% to 98wt%, and its density can reach 15.8~ 18.5g/cm3. Nickel, iron, copper serve as binder between tungsten grains and make the material ductile and more machinable. Tungsten dart billet belongs to the W-Ni-Fe series and is made by powder metallurgy techniques. 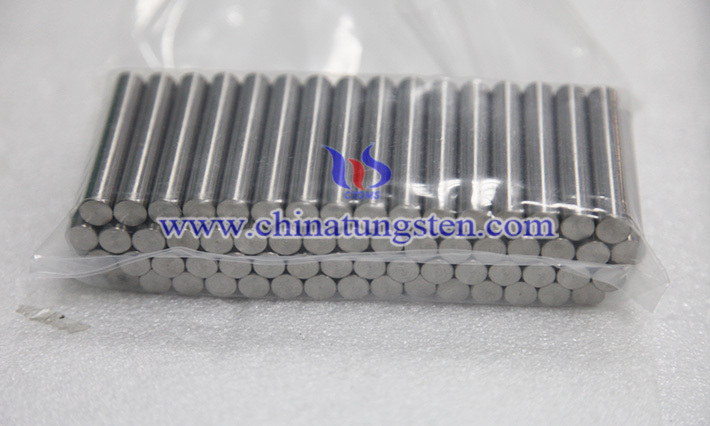 95W Ø7.15x54.6mm tungsten alloy billet price is 3.80USD/PC on Mar. 05, 2019. Tungsten alloy billets are actually tungsten cylinder rods after surface grinding by center-less processing, and their weights are varied from different tungsten contents and rod sizes. We could supply tungsten dart billets by various sizes and contents, popularly 70~90% billets are used for making both soft-tip and steel tip tungsten barrels, ranging from 14~18 gram and 18~40 gram respectively. 90W Ø8.74x50.8mm tungsten carbide rod price is 4.50USD/PC on Feb. 21, 2019. Tungsten carbide rod is also called tungsten alloy dart billets. The best material to manufacture these rods is tungsten, as it is very dense, and can made slim dart with a considerable weight. As 100% tungsten is difficult to machine, dart billets can be 90% tungsten, 7% nickel and 3% iron. Popularly 70~90% tungsten is used for making both soft-tip and steel tip barrels, ranging from 14~18 gram and 18~40 gram respectively. 95W Ø7.15x54.6mm tungsten dart billet price is 3.75USD/PC on Jan. 29, 2019. Tungsten dart billet, also called tungsten heavy alloy rod, is widely used for making dart barrels, which is because of its big density, and it has replaced copper to be the most popular material. Our advanced technology can make tungsten billet at economic cost. Size can freely follow customer's request. We can control the density from 16-18g/cm3. By this you can design your product accurately. 95W Ø6.35x45.72mm tungsten heavy alloy billet price is 2.10USD/PC on Jan. 02, 2019. Tungsten dart billets are basically tungsten cylinder rods after surface grinding by center-less processing. The advantage of using tungsten in the dart billets is that you can achieve the same weight as a thick brass barrel with highly slim design. Chinatungsten can supply billets by various sizes and contents, popularly 70~90% tungsten is used for making both soft-tip and steel-tip barrels, ranging from 14~18 gram and 18~40gram respectively, and sometimes offered following customers' specific request. 90W Ø6.35x45.72mm tungsten alloy dart billet price is 1.65USD/PC on Dec. 26, 2018. In a dart, barrel is the main part, which is made in different shapes, from cylinder. We can provide high grade tungsten alloy dart billets for making dart barrels that are slim and two or three of these can fit in the same area in treble bed. These cylinder rod shape tungsten dart billets are provided in different sizes, weights and contents. The knurling pattern is made on the barrels to give the player a confident grip. 95W Ø7.5x43.2mm tungsten alloy billet price is 3.00USD/PC on Dec. 07, 2018. Tungsten alloy billets are used to make dart barrels that form the main part of the dart. The billets are made of tungsten, nickel and copper, but with high density and environmental friendly, tungsten becomes standard material for making billets. For standard billet, its popular weight ranges from 14-18 grams and 18~40 gram for soft tip dart and steel tip dart, respectively. 90W Ø6.35x45.72mm tungsten darts billet price is 1.65USD/PC on Nov. 30, 2018. Tungsten dart billets are actually tungsten cylinder rods after surface grinding by center-less processing, and weights are varied from different tungsten contents and rod sizes. We can offer various range of billets, including W-Ni-Fe billet, W-Ni-Cu billet, W-Ni-Cu-Fe, etc. Customers’ specific designs are also welcomed.